Saturday morning was a bright and dry, if a little windy, affair. Several Bentley runners toed the line at parkruns around the world. Starting with the tourists, at Basildon parkrun Sam Godden was first female finisher in a swift 21:40. On the other side of the world Ruth Metcalfe continued her parkrun tour of New Zealand. This week she ran Cornwall parkrun in Auckland. The route was mostly on grass and included a long hill that the locals call ‘dead man’s hill’. Ruth said the run director made a point of asking unfamiliar faces where they had traveled from and Ruth’s presence prompted cries of ‘Come on Essex!’ as she approached the finish line. A little closer to home, Dave Goldsmith ran Bury St Edmunds parkrun for the first time, finishing in 20:10. Ben Ficken and pet dog Janice ran Mersea Island parkrun in a new 5k PB for Janice of 21:52. A little further down the coast at Harwich parkrun, Malcolm Jarvis ran 20:53, commenting that Wednesday’s yoga session at club must have done him some good. At the same event Cherie Hipkins ran 29:32. 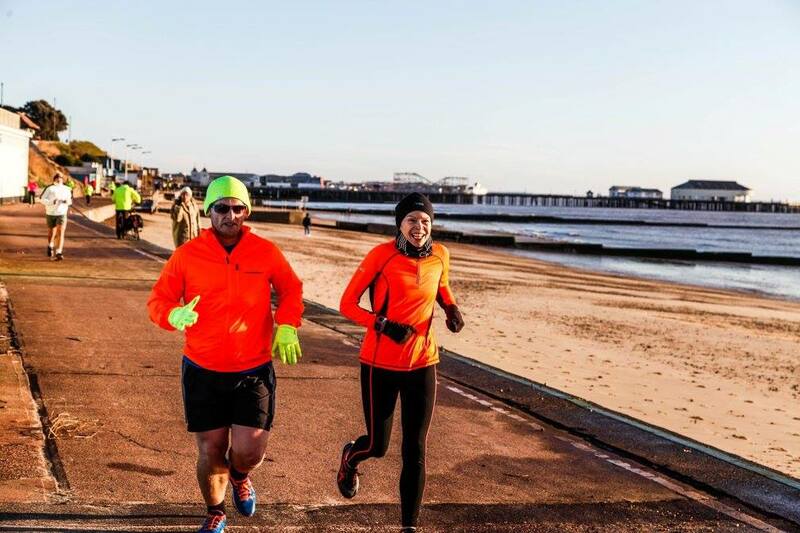 Jack Wicks and Alison Clarke at Clacton Seafront parkrun. It was a family affair at Clacton Seafront this weekend with Kevin James (24:29), Sandra James (35:08), Patrick Reynolds (21:02) and Claire Reynolds with buggy (38:28) all running. Patrick’s time was just one second outside of his course PB, and secured him a podium finish in third position. John Bush ran the event for the first time since he ran the inaugural event back in October. This week John took nearly a minute and a half off of his previous time, finishing in 33:55. Alison Clarke earned this week’s consistency prize. She ran 30:12 at Clacton Seafront parkrun for the second week in a row. Keeping Alison company was Jack Wicks (30:14). Davina Swindell (33:02) completed the Bentley representation. Colchester Castle parkrun hosted its 200th event on Saturday and six Great Bentley runners took on the undulations of Castle Park. Colin Farmer achieved a new course PB of 21:28. Claudia Keitch and Scott Young ran together, finishing in 29:42 and 29:43 respectively. Just eleven seconds apart were James McCullagh (23:27) and Andy Stephens (23:38). Rich Moore was Bentley’s first finisher, finishing in 15th position overall with a time of 20:23. Sunday morning was met with light drizzle as twelve Bentley runners took on the mud and hills of the Hadleigh Downs and the surrounding area when they completed the Benfleet 15. The race organisers describe the race as being a ‘A challenging 15 mile multi-terrain course’ event, and few who were there on Sunday morning could argue with that. With 648 feet of elevation gain (at least according to the author’s Garmin) and hills that were like mud slides, our runners certainly had their work cut out as they completed the 15 mile route. Chris Warren was first home for Bentley in his first 15 mile race. His time of 1:43:06 earned him a silver standard and position 9 in the club all time top ten men’s performances for the distance. Also getting into the top ten 15 mile performances list was Meera Rajoo-Oakley, whose time of 2:06:07, a five minute improvement on her time from last year, gained her the 9th position in the ladies’ table. It also earned Meera a club bronze standard. Also achieving bronze standards were Paul Davison (1:52:38) and Sarah Fletcher (2:19:37). Both Paul and Sarah said they will be back next year. Ben Ficken was running the race for the fifth time and finished in a course PB of 1:52:52. 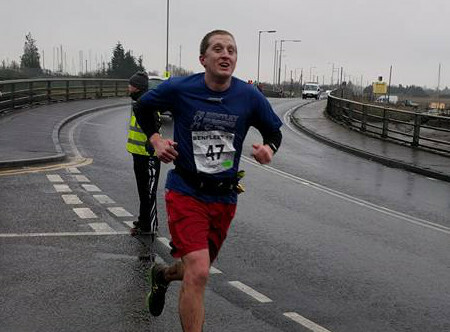 It was an unexpected PB for Ben who said ‘I don’t think I’ve ever ran (and walked a considerable amount) so badly in the last 2 miles of the course before!’ Also running a course PB was another Benfleet 15 regular, Frank Gardiner. Frank completed the race in 2:15:17. Barbara Law finished in 3:17:18. Vicky Presland was first Bentley female to finish when she crossed the line in 2:04:58. Gemma Colling (2:39:06) and Matt Jones (2:07:28) were both first timers at the course. Debs Cubberley (2:33:50) and Paul Hollidge (2:14:04) ran 15 mile PBs, both bettering their times from Bewl 15 last year. Debs described the experience as ‘the toughest, muddiest, hilliest race I’ve ever done and NO I won’t be doing it again next year!’ But she had high praise for the organisers and volunteers: ‘Great organisation and marshals did fab to stand out in the cold for so long but still managed to offer good support‘. Three Bentley juniors took part in Colchester junior parkrun this week. Harrison Leek (8:24) was first finisher for the third consecutive week. Yasmin Leek completed the 2k course in 16:24. Angel Jasper was fifth female finisher in 11:49. Finally, it almost goes without saying that Paul Blackwell ran a marathon this weekend. 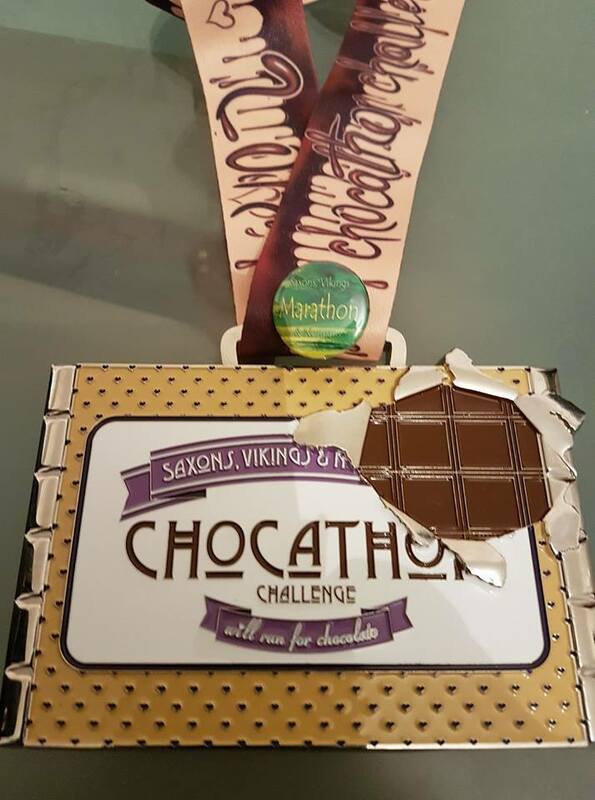 On Sunday he took part in the Chocathon Challenge organised by Saxons, Vikings & Normans events. This event was a time challenge, with runners invited to complete as many laps of the course as they wished within the time limit. Paul completed 6 laps, which totalled 26.2 miles. He described the trail course as ‘cold, wet and muddy’. The chocolate-themed event invited runners to ‘complete as many loops as you wish within the time limit, consume as much chocolate as wish within the time limit’, and issued the following warning: ‘this may be an event where you consume more calories than you burn off’. Paul Blackwell’s medal from the Chocathon Challenge.